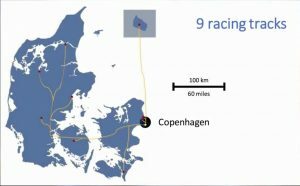 Production company STV Denmark and technology provider HDR are delivering live TV coverage on 232 race-days across nine tracks in Denmark this year, all with an IP backbone. 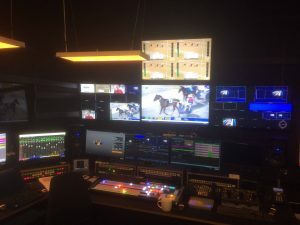 SVG Europe sat down with STV Head of Production Jens Villebro and HDR Systems Integration Technical Team Lead Marc Bostrom to learn how their remote IP production approach helped win the bid to produce coverage for Dansk Hestevæddeløb (DHV – the Danish horse betting organisation) in the first place and has since achieved low-staff, low-cost and low-latency on-air production from all of the far-flung race tracks around the country. The bid process took place last autumn and the launch of the new race track TV channel happened in January 2018. Regular productions are now taking place, with just one cameraman and two journalists at the race track and one host, one guest and one producer at the central location in Copenhagen. The equipment is transported to the race track by car and set up by the cameraman onsite. Live productions feature up to six video feeds from the race tracks and three return feeds, as well as multiple audio including comms. In all, STV is now providing coverage of 260 race days a year (some days at two or even three tracks) from nine different venues for the new Fast Track channel. HDR Denmark selected Nevion’s software-defined media node Virtuoso for JPEG 2000 IP WAN transport with FEC protection, its VikinX Sublime X2 hybrid router for baseband routing in the central facilities, and some Flashlink equipment for AV processing and Tally. HDR also picked VideoIPath to control the whole set-up from the central location in Copenhagen. there was a change in the law in Denmark, where gaming had been monopolised by the state game provider. The monopoly ended last year and the rights were given back to the sport of horse racing. “The sport needed to start up on a totally fresh channel; they couldn’t use anything that the old state gaming company had used. A fresh start: and that was actually the key for us as we didn’t have to inherit any old facilities, crew or anything – we could go back to the drawing board,” said Vellebro. “We talked to the guys at HDR and my wish was to try to eliminate any cost that did not end up on the screen, giving production value. So all thoughts of having OB trucks roaming around using diesel fuel, having to be serviced, putting people in hotels: that was a huge cost and as we have 232 production days from nine tracks around Denmark we needed to make a saving. “We also wanted a system based on IP where as little time as possible went into set-up time. It had to be very quick, where the three crew people start their day on the track and they require very little set-up time so they can produce for a long time – and then very little time rigging down. With everything we do, we really try to focus on putting our money onto the screen rather than all kinds of administrative costs,” he said. Where did the idea for IP remote production come from? Did you know horse racing could be delivered with this approach? 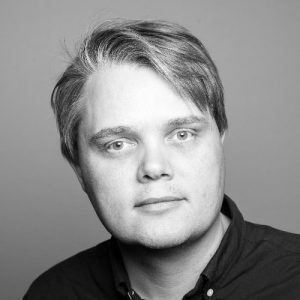 Jens Villebro: “We did know that remote IP production was a possibility because TV2 Denmark has been doing it for a couple of years. We knew of the technology per se, but we had no experience of it ourselves. Marc Bostrom: “We had done some preliminary planning, looking at the different possibilities of IP production. One of my primary concerns was to be able to do this on the internet lines we received from the client DHV (Danish horse racing). “We needed to get an overview on what they had ordered, and we had close dialogue with the telecom company Telia in terms of having them configure it in a way that our equipment could use. “This preliminary communication made it possible for us to do it not on fixed lines and not on ordered black fibre or grey fibre, but just on simple virtual MPLS which runs on normal switches with other traffic,” said Bostrom. “We’re covering nine tracks in Denmark, and some of these tracks are in the middle of nowhere. The big tracks have 1 Gig lines — which is fantastic and everything works. But that’s not the challenge: the challenge is getting everything to work from Zeeland in the south, knowing that there’s no fixed fibre or anything close to the track. The telecom company made it work: first time out we crashed the line totally and a couple of days later we tried again and it worked! “Having this close communication with the telecom company was really important so that we could do this IP production cost effectively. It’s always possible to order a black fibre and then make everything work with incredibly low latency. We needed to explain to the telecom company how important low latency and reply times are on the lines. All these things have to come together to make it possible to transmit broadcast quality video from broadcast quality cameras: not having extremely low latency would mean it is not possible,” said Bostrom. Low IP latency and a low equipment footprint meant you could operate with just a car and crew at the tracks. How did you approach the Copenhagen studio end, which features just one operator, a show host and a guest? Marc Bostrom: “We analysed the workflows of the person sitting operating this system. We worked through what STV wanted, keeping high production value. What do we need to be automated and how do we knit the different parts together including audio system, video mixer and PTZ cameras: how could we make it possible for one person to operate this production? is planned, it makes it easier for the operator to go from one situation to another, with one-button solutions where you ask a system to do something via salvo – this enables the operator to do many things at one time. “Back at base it’s configured for one operator, one host from STV and a guest who typically is an expert on horse trotting. At the track we have the commentator, a host reporter and one main operated camera, plus a PTZ camera controlled in Copenhagen. “At all times everybody can talk to each other so we have communication back and forth, both behind the lines and on-air from the studio to the track. 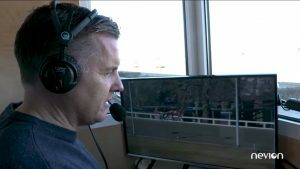 We’ve also incorporated signal-back so the guys at the track can see what’s on air, with tally and everything you need for a good TV production,” said Bostrom. How has it all worked out and are there any other opportunities to deploy this low-cost IP-based approach to production? 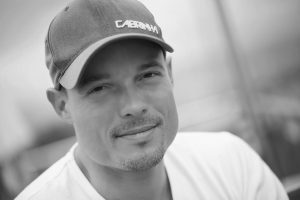 Jens Villebro: “The technical installation is working pretty much as we had hoped. We have tweaked a little on the editorial side, using the PTZ camera differently than we thought we would. “We have more guests at the track and so produce more airtime at the track rather than back at the studio. The system has been extremely flexible for us to move around – even if the criticism of highly automated systems is that they lock you in so that you’re not able to change anything. That hasn’t actually been our experience to this point. “We want do decrease the amount of crew and amount of handling, but the equipment is still too bulky. We hope the manufacturers are looking to scale their equipment down. Marc Bostrom: “There are plenty of sports that are viewed by a smaller number of people that could be interesting to take a look at, business-wise. Having this system is like a proof-of-concept that we can do it, to make viewable television for minority sports. “Revenues get more interesting when the costs are reduced: as Jens has said, driving around with big trucks is just very expensive so this opens up a lot of other possibilities for second and third division sports. 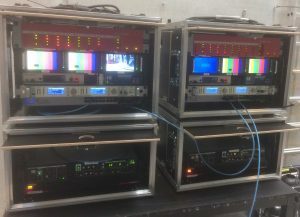 “HDR is absolutely looking at this area – even though we have a large fleet of OB trucks and we do not see them becoming obsolete because of this. We’re just looking at new business possibilities in doing this type of production,” said Bostrom.